Think of our vehicle cover as a portable garage to protect your 1984-2001 XJ Cherokee, 1999-2004 WJ Grand Cherokee or 2005-2010 WK Grand Cherokee from the elements. This gray vehicle cover is made of washable Evolution material that resists moisture from the outside but is breathable, so it won't trap moisture against your finish on the inside. It is cut to fit your Jeep like a glove, with mirror pockets and elastic bottom edges at the front and rear, along with tie-down grommets for extra security. There's even a clear license plate window. 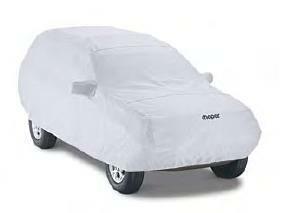 Protect your Jeep anywhere with this vehicle cover.